Info "Try dialing the numbers you get from the souvenir machine." 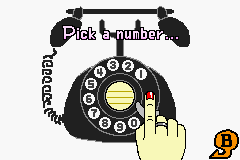 Telephone is a souvenir in WarioWare: Twisted! found in the Other section. It features a rotary telephone that can be used to dial four-digit phone numbers. These numbers are obtained after completing a character's stage once no other souvenirs can be obtained from them. Every (functional) number is accompanied with a short line of dialog and a generic, but appropriate, icon appearing from the phone. Some phone numbers produce different dialogue if they are called multiple times. "Ew! You creep! Why are you calling me at this hour? Creep!" "I told you not to call me at this number! My line is tapped! There following me! Oh, no! They found me! Save yourse-- Beep.... Beep...."
"Hello! I'm getting bad reception here, but when do you think you'll be able to join us? What am I saying? We'll wait for you as long as we need to, so don't rush. See you later!"" "This is the weather report. Next year's forecast is rain. Typical."" "Today's report is rain. But you should know that, 'cause your phone is pouring!"" "This is the weather report. Tomorrow's forecast calls for...rain! Surprise, surprise."" "Hey! Long time no talk! How've you been? I'm so happy that you called! We've gotten settled in and are almost ready for guests. When are you coming?" "Fronk here, whatcha want? I see... The meaning of life is what you seek? This is a question far less important than those that plague me." "Fronk here. WHAT?! You're seeking the meaning of life? The meaning of life might be to find the meaning of life. Deep, I know." "Fronk here. What can I do for you? The meaning of life is what you seek? I don't know why you think I have the answer. OK. Here's a platitude for you: Change your perspective, and you might find the answer you're looking for. Satisfied?" "Fronk here. You want to know the meaning to life? How fortunate for you to have the leisure to ponder such things. Some of us have these things called JOBS! " "Fronk here. You keep asking me the meaning of life, and all I can say is I DON'T KNOW. For all know, there IS NO MEANING! Aw, quit being so glum. Have a piece of candy!" "This is the dice phone. When you need a number, give me a call! And here is your roll... You got a 1/2/3/4/5/6!"" "Hey! Remember me? The guy you sent the Dear John letter to today?! The guy YOU DUMPED?! Just wanted to say Good Riddance!" "Hi there! You’ve reached Mona. I've just popped out for a bit, so try me again later!"" "Hello! This is Mona! I'm a little busy right now! Would you please try me again later?"" "Hello. Oh, you want to talk to Mona? She was just here. She probably went to the pizza shop."" "Hey! Where'd you get this number? Doesn't matter! I'm gonna give you a number, and you need to call it! It's 8324. Got it?" "Hello. Are you being a good kid? I'm sorry I'm always coming home so late. I'm going to hurry up and finish here, so I can come home. Don't hate me, OK? I love you, and I'll be home soon."" "Alone... So alone... I'm all alone... Won't someone play with me?" "Buon giorno! Mona Pizza, Joe speaking. Who? Mona? She just left for school. Enough about that, though. Did I tell you my name is Joe? I'm the manager. And I'm a dog! My mom is so proud. You see, all the other dogs in my family just became pets. I'm really the only working dog in my family. Except for that one cousin who works with the blind. Huh? Oh yeah, your order..."
"Buon giorno! Mona Pizza, Joe speaking. Mona? She's on a date. Enough about that, though. Did I tell you my name is Joe? Believe it or not, I'm a dog. I like how they trust me not to eat the pizzas. That's how I got to be manager! Plus, I look pretty debonair in this chef's hat, don't you think? What's that? Oh yeah, your order..."
"Buon giorno! Mona Pizza! My name is Joe! I'm the manager of this joint! What? Mona? She's out delivering pies! Enough about that, though. Did I tell you my name is Joe? Believe it or not, I'm a dog. You wouldn't think I'd be able to work my way up to manager, huh? On account of the lack of thumbs and lips and all. What's that? Oh yeah, your order..."
"Helpful hint guy says, "Never leave home without a helmet!"" "Hello. I'm the helpful hint guy! if your game doesn’t seem to be working correctly, you might want to try giving it a break. Pause the game for a bit. It should be fine when you come back to it. "Hello, I'm the helpful hint guy! Did you know you can make the messages at the bottom of the screen scroll faster by pressing ? What? You already knew that? Never mind then..."
"Hello. I'm the helpful hint guy! Ever been playing "WarioWare: Twisted!" and accidentally pressed START and paused your game? Try changing the Pause setting in the Options menu."" "Hello. I'm the helpful hint guy! You know how you collect games in the Spindex? Once you have collected all the games, you can open a secret game? Oooh, mysterious."" "You've reached the WarioWare Psychic Hotline. Oooooh! For just twenty dollars a minute, I will slowly reveal the secret meestreies from beyond the unknown. I will give you clarity and lightness of wallet. Oooh!"" "Hellooo! What can I do ya for? Oh, you're right! I'm going to be late! Thanks for the call!"" "Whassup! Pizza D Here! During my last delivery, I slipped on something and bit it hard! Consequently, I've decided to close the shop for the day... Try again tomorrow. Sorry!" "Hello, Pizza Dinosaur here! Mona Pizza's closed today. I heard they're going to be closed through next year. We here at Pizza Dinosaur never close, so let us know what you want, when you want it! And we'll bring you something you didn’t order in a couple days." "You've reached Pizza Dinosaur, where our motto is CRUSH THE COMPETITION. Our special today is the T-Rex set. But don't worry, it's not like we use lizard meat or anything... We would never do-- Wait! Hello? Did you hang up?" "Your fortune today is--I'm sorry to say--TERRIBLE! You might want to go back to bed." "Your fortune today is... Just so-so. Eh." "Your fortune today is... Pretty good! It might be a good idea to try something new." "Your fortune today is...Pure joy! Everything will go the way you want it to! Yippy Skippy!" "You're working hard. Shaking your system can take a lot outta you, so make sure you take breaks, 'k? Don't work yourself too hard!" "Did you call me earlier? What? You didn’t? This is a wrong number? What's going on?!"" "Hey! You must hang up now! Quickly! If you don't hang up now, there'll be trouble! What? You don't know how to? Press ! Press to hang up, I said! Why are you still there! I said, hang up! Do it! Now! Please! Hang up! Oh yeah, I guess I could hang up on you. CLICK." "Oh... Hey, thanks for yesterday. I had a great time. We should do it again soon. Thanks for calling. I'll talk to you later!" "Hey! Where'd you get this number? Doesn't matter! I'm gonna give you a number, and you need to call it! It's 2569. Got it?" "You scared me! My phone never rings! I'm going to give you a number, so you call it OK? It's 7946." "I think this kind of thing happens all the time! Don't sweat the small stuff!" "Wahhahaha... Hyahahahaha... Heeheeheehee... Hehehehehehe... Hohohohoho!" "Oops, I made a mistake!"" "Listen, pal. I already told you I'm not interested in whatever you're selling, not stop calling during dinner!" This page was last edited on January 20, 2018, at 14:06.